The Emily Brontë Song Cycle is a new work commissioned by the Brontë Society, written and recorded using Emily Brontë"s piano in her home, by composer, pianist and producer Adrian McNally of the band The Unthanks, and performed with sisters Rachel & Becky Unthank. 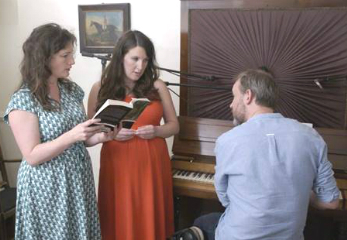 The Unthanks have taken ten Emily Brontë poems and turned them into song. As the Brontë family home in Haworth, Yorkshire, is now a working museum, the writing and recording had to take place after nightfall. Adrian McNally wrote the music for the whole record during his first evening at Emily's piano, a rare example of a 5-octave cabinet piano, probably made in London between 1810 and 1815. The days of the residency were spent working on the songs on a German upright at nearby Ponden Hall - another house associated with the Brontë family - before testing his work in progress on Emily's instrument at the Museum each evening. Several weeks later, McNally returned to the Parsonage with Rachel & Becky Unthank to record the songs, late into the night. "The time spent by Adrian creating the song cycle has been a pleasure to witness as it came to life in the Museum, bringing music back into the rooms where the whole family had enjoyed the same piano so many years ago. "The link between Emily's words and the wild surroundings of the moors has an eternal fascination for visitors and we look forward to how the song cycle and listening experience brings a new interpretation to the well-trodden paths around the area the Brontës knew so well." The Unthanks selected the Emily Brontë poems that spoke to them most, including Shall Earth No More Inspire Thee, High Waving Heather, Lines (The Soft Unclouded Blue of Earth) and The Night Is Darkening Round Me. The award-winning band are synonymous with bringing historic-based projects to life, drawing attention to subjects including the Foundling Museum, The Children"s Employment Act of 1842, the shipbuilding and coal-mining industries, as well as underlining the work of important artists such as Molly Drake, Robert Wyatt and Graham Miles. It was for their last project, The Songs And Poems Of Molly Drake, that The Unthanks teamed up with Molly Drake's daughter, the actress Gabrielle Drake, who along with being an invaluable and generous guide to Molly's work, recorded her mother"s poems for The Unthanks to set to music. So taken were the band by her performances, and by how she brought the poems to life, making them her own as well as serving her mother's words, that Gabrielle is truly given centre stage for parts of the record, with The Unthanks setting spoken word to music, rather than turning the poems into song. "I really do feel it might be our best work," said pianist and producer Adrian McNally. "And the reason at the heart of that I think is because it is perhaps the best work we have worked on. Molly's writing and Gabrielle's performances are tools of great precision and truth. "At the same time it has been hard, partly because her writing is so sharp and the music so deft – it"s like driving a Ferrari for the first time - you're all over the road before you learn how to harness it. Our most rewarding Diversion so far perhaps." While Tyneside sisters Rachel & Becky Unthank are commonly associated with the traditional music of the North East, bandmate, writer & pianist Adrian McNally is actually Barnsley born & bred. The lines in Part One - Lillian Bilocca were written by actor and writer Maxine Peake and turned into song by McNally. The songs were originally performed live by The Unthanks in 'The Last Testament of Lillian Bilocca', the acclaimed site-specific theatre event written by Peake for Hull City of Culture, about the Hull Triple Trawler Disaster of 1968 in which 58 men lost their lives. The lines for Part Two – World War One, are those of WW1 poems and letters and focusing on the lesser heard female voices from the time. The songs were originally conceived for a live audio-visual project called 'A Time and A Place', which took place in 2014, the opening year of WW1 centenary commemorations, The Unthanks deciding to release them in this, the final year. The Unthanks release The Emily Bronte Song Cycle as the third part of Lines, a trilogy of records inspired by poetry, and portraying female perspectives from different points in time. The Unthanks - Unaccompanied - As We Are, will be at St George's Church, Brighton, on Saturday 27th April 2019. CLICK HERE for tickets.